Fastball, Curve Or Slider – What Flies Higher? Which pitch did 500 Home Run Club members prefer, and Why? Henry Aaron (shown in this 1957 picture with Ted Williams below) said the best way to hit the curve ball was not to miss the fastball. "Guessing what the pitcher is going to throw is eighty percent of being a successful hitter. The other twenty percent is just execution." Of course guessing what the opposing pitcher would throw was easier for Aaron than for most MLB players, thanks to his incredible intelligence and baseball instinct. It also didn’t hurt that he had two of the quickest wrists in baseball history. 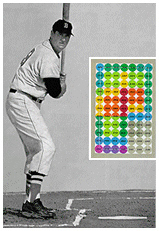 Ted considered pitches down the center of the plate from waist high to his fists on the bat to be in his “happy zone” - where he could hit .400 or better (see diagram in photo to right). As chronicled in the Pepsi commercial with Ken Griffey, Jr. and Sammy Sosa that debuted during the 2001 All-Star Game telecast, great hitters have claimed they see things at a different pace while at the plate. Thanks to their superhuman concentration and skill, 500 Home Run Club members like Griffey and Sosa had enough time to think about whether the pitch was a fastball, slider or ..."Hmmm... did I lock my keys in the car?" Certainly an exaggeration, but you get the point; great hitters see things so well they appear to be in slow motion. 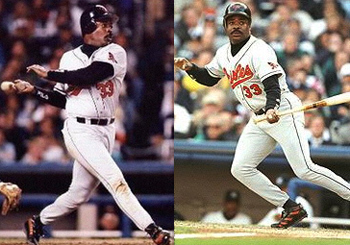 In 1973, as a rookie moving quickly up through the Orioles’ minor league system, “Steady Eddie” Murray encountered a hitting problem that has ended the professional career of many promising baseball players before they reach the major leagues – the curve ball. After hitting well over .300 in Rookie league and Double AA ball, Murray’s hitting fell to off to .264. A natural switch-hitter, Murray had been coached to bat right-handed exclusively, and right handed pitchers were making him look sick with curve balls low and away. Cal Ripken, Sr., who was serving as the Oriole’s troubleshooter in the minor leagues, encourage Murray to start switch-hitting again, just like he did in high school. As a result, those curve balls from the right-handers broke into him, instead of away, and he was able to reach them easier. Better yet, Ripken advised, he might start seeing more fast balls. Over the next 14 days, Murray batting left handed against right-handers, rapped out ten hits in 31 times at bat for a .322 average…and the rest is 500 Home Run Club history. “I didn’t worry about ‘What kind of pitch am I going to get’ or ‘Am I gonna have a good swing?’ I knew I was going to have the barrel of the bat in the pay zone if the guy threw me a strike,” said “Mr. 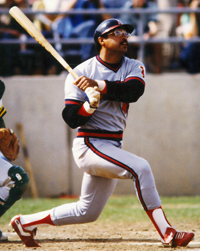 October” Reggie Jackson, after hitting five home runs against the Dodgers in the 1977 World Series. On the other hand, there were some fastball pitchers that Jackson would just as soon not face. "Every hitter likes fastballs just like everybody likes ice cream. But you don't like it when someone's stuffing it into you by the gallon. That's how you feel when (Nolan) Ryan's throwing balls by you,” he said in a June 1975 Newsweek interview. “I'm not so sure McGwire would be looking for 62 against me; he might be content to wait for the next guy,” said a self-confident Gibson. “I'd be pumped up enough to really run the ball up there, and I'm not giving any secrets away by saying that McGwire doesn't handle the hard stuff belt-high or up a little bit. In that respect, pitching to McGwire wouldn't be as tough as pitching to Hank Aaron or Willie Mays. There's no way I'd throw a fastball up and in to Hank Aaron.